Our lab, much like yours, studies, tests, reviews and analyzes...except we analyze stools and ways to improve them within your lab! Check out our results Durable yet extremely easy to clean, this comfortable, long-wearing vinyl upholstered stool with generously cushioned seat is perfect for any environment, but works wonders in medical, laboratory and educational settings. 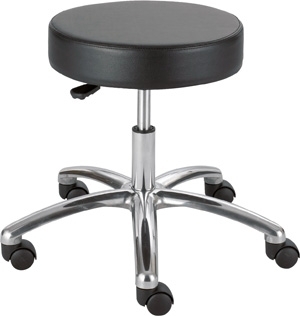 Stool features a 5" pneumatic lift to handle a variety of tasks at different work surface heights. Stable 5-star base with 2" swivel casters. Some assembly required.